First Line: I'm not a ghost. 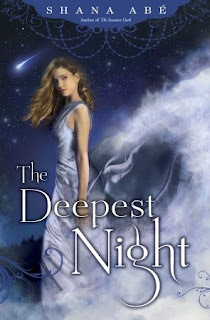 Review: I found The Deepest Night to suffer the same problem I had with The Darkest Night which is that it started off a little slow but once Armand and Lora went off on their mission across enemy lines to rescue Armand's brother Aubrey whom they just found out is alive and is another Drakon the pacing of the book picked up. I was really hoping by some miraculous way Jesse would be brought back since he was some type of supernatural star guy but that was not the case. Instead the focus goes to Lora and Armand and the development of their relationship. Which don't get me wrong I really like Armand but what bugged me was how quickly Lora got over Jesse who she was so deeply in love with in the last book and by the end of this book she was in love with Armand. I guess I just expected a more slower healing and mourning process from her with the depth of love she had for Jesse. I did like how all the characters were very well developed. Armand actually was a great male lead he has been going through a lot with his father ending up in a mental hospital, thinking his brother is dead ( which we discover is not the case ) and having to become the head of his household and in his community and he is dealing with all this while trying to master his Drakon abilities. Needless to say I think his character grew a lot and I saw him in a whole different light then what I had perceived of him in the first book. As for Lora besides my little gripe with her and the Jesse ordeal I still found my self rooting for her. She is such a strong girl who's been through hell and back in her young life so it's hard not to want her to succeed in everything she sets out to do. I was hoping for some answers in this book but didn't really get much. For example we still don't know much about the Star people or why the Drakons and them are so connected and then there is Lora and her life before the orphanage, she still doesn't really remember anything so I'm hoping the next book explains all of that. Overall even with the little issues I had I still enjoyed The Deepest Night and will be looking forward to the next in the series since I have found myself to be invested in the characters and I need to see what happens to them.